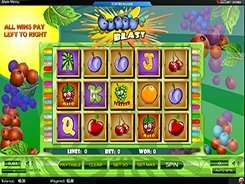 Berry Blast is a sparkling, vibrant and effervescent 5-reel slot that has 30 fixed paylines and is loaded with enjoyable bonus features. 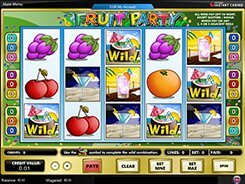 The slot is targeted to low-limit players and mid-rollers as a total bet may vary from $0.3 to $75 per spin. The reels and background picture are stuffed with fresh and juicy fruits and berries, and even classic playing cards – letters J, Q, K and A – look as if they were carved of different fruits. The slot has a wild symbol that performs its traditional function as a substitute for other icons. 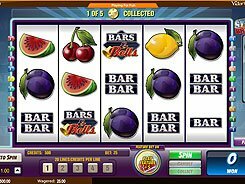 Besides, five wilds build up the slot’s most beneficial combination that awards 10,000 coins ($25,000). Berry Blast has a free spin feature initiated when the Strawberry symbol occurs on the 1st and 5th reel at a time. There are then two scatter symbols (Green Grapes and Purple Grapes) that pay out independently of where exactly they have landed. 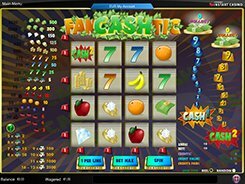 Finally, the slot has a wheel of fortune type bonus feature triggered by three Blueberry symbols and played on the second screen. PLAY FOR REAL MONEY!